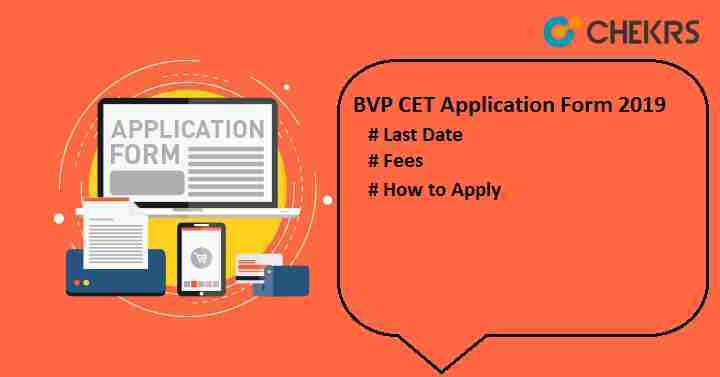 BVP CET 2019 Application Form: Bharati Vidyapeeth (BVP), Pune is a deemed to be university offers various courses in the field of Medicine, Nursing, Pharmacy, Engineering, and Management etc. Bharati Vidyapeeth Common Entrance Test (BVP CET 2019) is a university level entrance exam conducted for candidates seeking admission in various UG & PG courses like B.Tech, M.Tech, MCA, MBA, LLB etc. Candidates who wish to take admission in Bharati vidyapeeth can apply for the BVP CET Application Form. The University will commence the application form in the month of January. Form will be available online. Candidates can fill the form according to the course of their choice. On the basis on marks obtained in the BVP CET, candidates will get admission in BVP University. All dates for BVP CET 2019 are very important. Candidates seeking admission in various courses in BVP can see the expected schedules of BVP CET 2019. Here we have mentioned the BVP CET 2019 Important Date. Check the list once before applying for the application form. All interested candidates are advised to ensure the BVP CET Eligibility Criteria before applying for the application form. Candidates who fail to meet the admission criteria of BVP will not be considered for admission process in Bharati Vidyapeeth University. B.Tech./ BA LLB / B. Pharm/ BBA / BCA / LLB · Candidate must pass 10+2/equivalent exam from any recognized board. · Candidates should have subjects like Physics, Chemistry & Mathematics in 12th. Candidates must have scored minimum 50% marks in class 12 in PCM (For SC/ST candidates, there will be relaxation of 5% marks). MCA Must have a bachelor’s degree with mathematics. Secure minimum 50% aggregate marks in graduation. MBA Must have a bachelor’s degree from any stream. Score atleast 50% aggregate in UG programme. Click on the link “Apply Online Admission 2019”given on the home page of BVP. It will re-direct to next page. Click on “New Applicants Click Here” for candidates who want to apply for the entrance test. Enter the details like first name, last name ,mobile no, mail id etc and click on the sign up button. After Sign up, Log in into your account, with the generated UserID / Email Address & password. Login details will be send to the candidates mobile no or mail id. After login into the account, select the course name & fill the BVP CET Application Form with all personal and academic details. Upload scanned passport size photograph & signature of file size less than 60 kb. Click on submit button. After this, click on pay now to pay the Bharati Vidyapeeth Application Fee. Payment will be done through online mode only. After payment process, take the print of application form for future use. The BVP CET Application Fee can be paid through Online and Offline mode. In Online mode, candidates can pay using Credit, Debit card, and net banking, on the other hand in Offline, candidates can pay the fee through Post-Office. The fee details are given below. For better prepration, you can also download the BVP CET Syllabus 2019 and know the subjects and exam pattern.